In early-summer 2014, a New York City-based real estate company decided it was time to utilize the perfect marketing tool to engage their customers – the surrounding area. The company presumed the ideal way to do so would be to bring the outdoor scenic views inside. In order to bring the outdoors in, the real estate company wanted to create a transparent lobby in one of their buildings in Jersey City, New Jersey. Keeping their customers in mind, they wanted to focus on the idea that Jersey Ity is somewhat of a staple to most people looking to relocate to the area. It’s close enough to Manhattan to be able to enjoy the city life, while still keeping a slight distance from the hustle and bustle. The real estate company decided to take these ideas and bring them to life. Their ultimate goal was to make their customers feel as though they brought the outdoors in, focusing on scenic views of the New York Harbor, the Freedom Tower, passing boats, and the New York City skyline. During inclement weather, the real estate company still wanted customers to see the beauty in the area, while also providing additional content on available properties, local activities and places of interest. To complete such a project, the real estate company turned to ESSENTIALCOM, integrators they had workedwith previously. ESSENTIALCOM knew they would need a digital signage solution that was user-friendly, maintenance free, and easily accessible for the few times the real estate company would need to access the back of the displays. The team at ESSENTIALCOM also considered the timeliness of the project, estimating it would be completed for the end of July/beginning of August. ESSENTIALCOM chose to work with Peerless-AV, based on their professionalism and reliable, high quality products. After with Peerless-AV and sharing their ideas on how to bring the outdoors inside, it was decided that ESSENTIALCOM would install a 5×4 video wall display using the Peerless-AV SmartMount Full-Service Video Wall Mount with Quick Release (DS-VW765-LQR). The DS-VW765-LQR was ideal for the real estate company because it has a no-tool-required micro-adjustment feature and provides easy-access to any display, making it the most efficient mount for installation and accessibility. Its custom wall plate spacers eliminate guesswork and tedious installation procedures, reducing installation time and cost for both ESSENTIALCOM and the real estate company. Some additional features of the mount are the quick-release, pop-out mechanism, which provides convenient display access in recessed applications, with a locking ability to disable unintentional pop-outs. Its carriage extension force can be adjusted to accommodate the weight of the display, allowing the quick release to activate with gentle force, and integrated cable management tie-backs make display-to-display cabling simple. The real estate company was exceptionally pleased with the installation of the Peerless-AV SmartMount Full-Service Video Wall Mount with Quick Release. ESSENTIALCOM was able to deliver the ideal solution for bringing the outdoor feel inside of the lobby within a timely manner. ESSENTIALCOM thoroughly enjoyed the ease of installation and the accessibility the mounts offer. The real estate company has said that wall of displays immediately captures the attention of customers and has them feeling fully immersed in the location and lifestyle of Jersey City. 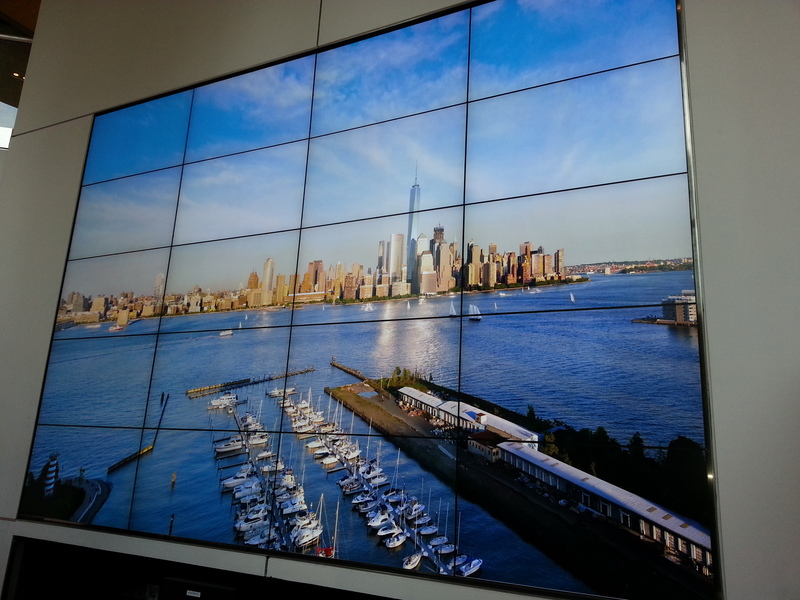 With a HD 1080 PTZ (Pan Tilt Zoom) Camera installed by ESSENTIALCOM on the rear, marina side of the building, the video wall greets customers and employees of the real estate company with live streaming images of the New York Harbor, the Freedom Tower, the New York City skyline, and the Hudson River. According to the real estate company, the Peerless-AV SmartMount Full-Service Video Wall Mount with Quick Release has significantly improved the ambiance in the lobby and has allowed them to continue adding additional content regarding new listings and local events. During times of inclement weather, the real estate agency has the option to switch to Ultra High Definition (UHD) static images to showcase the exterior building with marina views and bird view images of the building looking at Manhattan. The real estate company also uses the video wall to showcase a static image complimenting the lobby design with the building number moving across the screen. For more information about Peerless-AV video wall displays and mounts, please visit: www.peerless-av.com.